Welcome to my blog of inner thoughts and outer experiences. Of writers, writing and wayfaring in all their glorious forms. One night as I lay in bed trying to get to sleep, the possums on my roof were making such a din that I yelled at my ceiling … What’s going on up there? Are you in training for the circus? … and then the idea struck for a poem that I quickly scribbled into the notebook beside my bed. And here it is (after lots of fiddling for rhythm and rhyme), illustrated by Gabriel Evans, in The School Magazine, for you to commiserate with during those noisy, sleepless nights … Possum Circus. I’d love to hear your possum stories. 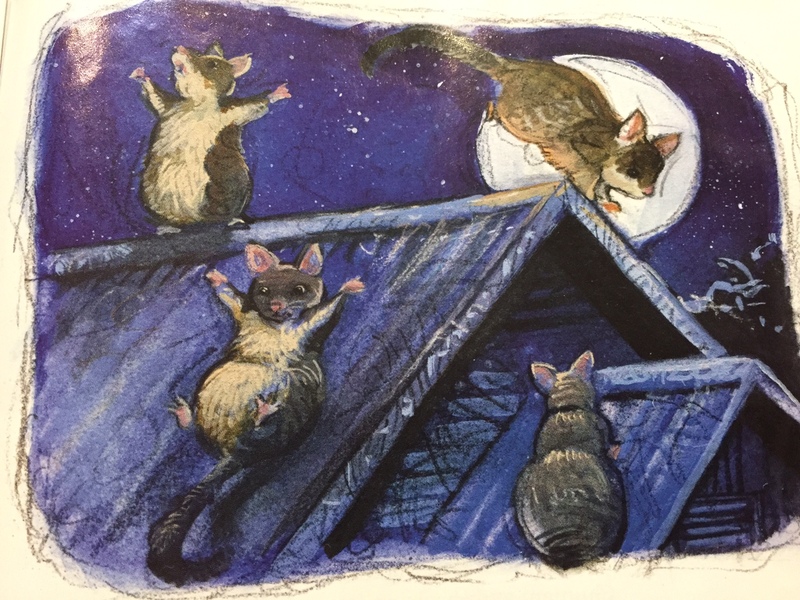 And … the possums are still performing on my roof – I think they’re now training for the Possum Olympics! This entry was posted in Uncategorized and tagged Australia, Gabriel Evans, poetry, possums, The School Magazine on February 27, 2017 by marian. Love it! I can totally relate, though perhaps I feel less cheerful and more marsupialicidal than you, Marian. Excellent meter and rhyme and what a fab artist you’ve got there! Ha! Love your comment, Rachel. It’s something that unites all of us Aussies. Gabriel (lovely name by the way) is a beautiful picture book illustrator as well as an artist – I am indeed honoured that he agreed to illustrate my little poem. I’d love to buy a print of that illustration. Is that possible? Hi Kirsten, it’s a lovely illustration by Gabriel Evans. I guess you’d have to contact The School Magazine to see if this is possible. I stumbled across this link tonight was so excited to be able to read Possum Circus to my little boy at bedtime. Coincidentally, the theme for this term at his school is ‘the circus’. I’ll ask The School Magazine about getting a reprint for his class. Thanks for sharing this absolutely charming poem. Thanks Stephanie. I’m so delighted that you read my possum poem to your little boy. Long live the fun of the circus.